It’s like this for Secret. Photo by alex mertzanis on Flickr. A selection of 10 links for you. Like brandy butter for your brain. I’m charlesarthur on Twitter. Observations and links welcome. OnePlus’s flagship phone shipped close to 1 million phones at the end of last year. It’s a good sign for Cyanogen, which also managed to bring on board Microsoft as a partner this month. But as for OnePlus, its ties with Cyanogen are probably ending. Earlier this month OnePlus launched its own custom Android ROM, built with a simple interface that could replace the CyanogenMod. The change means that OnePlus can offer “faster, more meaningful updates”, according to the Chinese company. Cyanogen, however, will continue offering support to OnePlus phones still running its OS. Cyanogen, plus Microsoft, is for me the most interesting thing happening in smartphones. That afternoon, a plump 48-year-old musician was one of several customers to drop by the rented room. A German customer had paid the musician in Bitcoin for some freelance compositions, and the musician needed to turn them into dollars. Castiglione joked about the corruption of Argentine politics as he peeled off five $100 bills, which he was trading for a little more than 1.5 Bitcoins, and gave them to his client. The musician did not hand over anything in return; before showing up, he had transferred the Bitcoins — in essence, digital tokens that exist only as entries in a digital ledger — from his Bitcoin address to Castiglione’s. Had the German client instead sent euros to a bank in Argentina, the musician would have been required to fill out a form to receive payment and, as a result of the country’s currency controls, sacrificed roughly 30% of his earnings to change his euros into pesos. Bitcoin makes it easier to move money the other way too. The day before, the owner of a small manufacturing company bought $20,000 worth of Bitcoin from Castiglione in order to get his money to the United States, where he needed to pay a vendor, a transaction far easier and less expensive than moving funds through Argentine banks. A new rule: any country under sustained currency pressure will see citizens increasingly turning to bitcoin to evade currency controls. After a lot of thought and consultation with our board, I’ve decided to shut down Secret. I’m extremely proud of our team, which has built a product that was used by over 15 million people and pushed the boundaries of traditional social media. 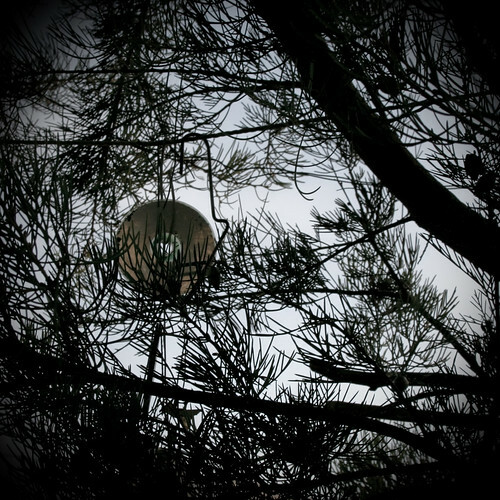 I believe in honest, open communication and creative expression, and anonymity is a great device to achieve it. But it’s also the ultimate double-edged sword, which must be wielded with great respect and care. I look forward to seeing what others in this space do over time. Mobile’s rise over the past few years has been well-documented as it continues to achieve major milestones illustrating its immense popularity, such as last year when app usage surpassed desktop usage and began accounting for half of all U.S. digital media consumption. But its latest milestone shows just how far this platform has come in overtaking desktop’s longstanding dominance as the primary gateway to the internet. For the first time in March, the number of mobile-only adult internet users exceeded the number of desktop-only internet users. 11.3% against 10.6% (the other 78.1% used both, of course). Tablets are counted as “mobile”; desktops still account for 87% of digital commerce. The latter number used to be 100%, of course. I have no idea why an iOS or Android developer would want to bother doing this. Putting an app onto a different platform involves immediate cost and future cost (in support). Can Windows 10 Phone (or whatever it is) really repay that? Most of the accounts Casipong creates are sold to these digital middlemen—“click farms” as they have come to be known. It’s a full-time job. 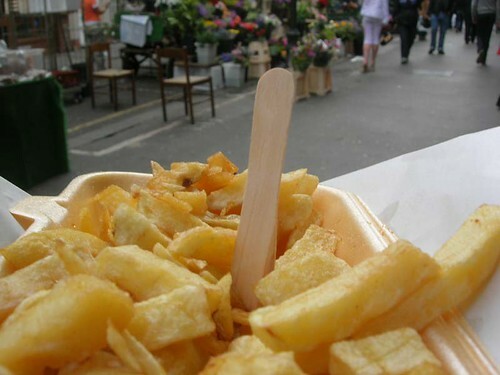 Where’s the government promise to create work like this in the UK, eh? Apple has warned investors that it could face “material” financial penalties from the European Commission’s investigation into its tax deals with Ireland — the first time it has disclosed the potential consequences of the probe. Under US securities rules, a material event is usually defined as 5% of a company’s average pre-tax earnings for the past three years. For Apple, which reported the highest quarterly profit ever for a US company in January, that could exceed $2.5bn, according to FT calculations. The warning came in Apple’s regular 10-Q filing to the Securities and Exchange Commission on Tuesday, a day after it reported first-quarter revenues of $58bn and net income of $13.6bn. Forgotten what it’s about? Here’s some background. The part involved is the so-called taptic engine, designed by Apple to produce the sensation of being tapped on the wrist. After mass production began in February, reliability testing revealed that some taptic engines supplied by AAC Technologies Holdings of Shenzhen, China, started to break down over time, the people familiar with the matter said. One of those people said Apple scrapped some completed watches as a result. Makes sense; some reviewers have complained about not getting anything noticeable “taps” in Watches they tried. Apple has moved to a different supplier, it seems, but is supply-constrained. Over half of the top Google Play countries are emerging markets. By download, that is, not revenue. What if, instead, an AI were more like a multicellular organism, a eukaryote evolution beyond our prokaryote selves? What’s more, what if we were not even the cells of such an organism, but its microbiome? And what if the intelligence of that eukaryote today was like the intelligence of Grypania spiralis, not yet self-aware as a human is aware, but still irrevocably on the evolutionary path that led to today’s humans. 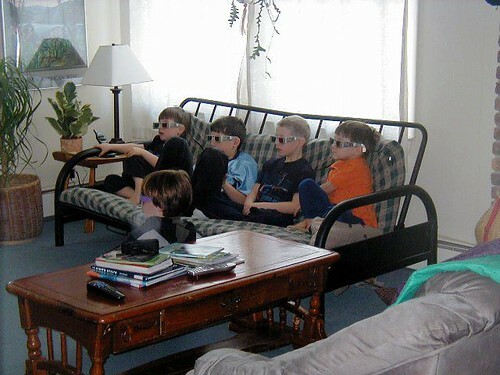 3D TV. Are we sure this was a good idea? Photo by Jen’s Art & Soul on Flickr. …If the commission does crack down on Android, we may see a large fine against the company, Logan says. Or we may see a dissolution of those Google contracts with handset makers. That may be the biggest threat to Google. Googles doesn’t make money from Android. It makes money from the ad-driven services that run atop the OS. And with Oracle, Microsoft, and so many others pushing so hard, those services may lose at least part of their foothold. I still find the Android complaint far less persuasive than the search one. Lots of Americans see it the other way round. Achieving outstanding scores in DxOMark Mobile industry standard tests, the Samsung Galaxy S6 Edge becomes the new top-ranked device in our database. In fact, Samsung now occupies the top two spots for Mobile image quality with the Galaxy Note 4 also posting impressive results. We are publishing both the S6 Edge and Note 4 results simultaneously, so let’s start by analyzing the photographic strengths of Samsung’s flagship Smartphone. Displaces the iPhone 6 and 6 Plus at the top. There’s a fairly constant game of leapfrog going on. Also, DXOMark is going to hit the 100 some time in the next couple of years, which might be a problem for its marking scheme. …Other highlight specs include a Qualcomm Snapdragon 808 processor, 3GB of RAM, 32GB of internal storage, a 3,000mAh removable battery (but no Qualcomm QuickCharge support or built-in wireless charging), and a Micro SD card slot. LG also says that the GPS navigation and location services on the G4 are twice as accurate as other phones. 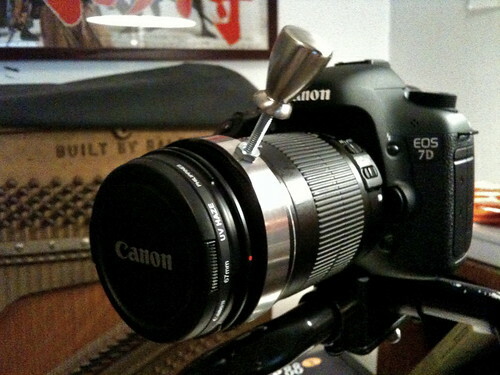 Very much want to see how the SD card/removable battery gambit plays out. This will test whether all those people saying it’s a dealbreaker not having them on the Samsung are just posturing. Or, maybe, whether there just aren’t that many of those people. Google’s YouTube will directly invest in new shows to be launched in partnerships with its four top content creators, it said in a blog on Tuesday. The world’s No. 1 online video website also said it entered into an agreement with DreamWorks Animation SKG Inc unit AwesomenessTV to release feature films over the next two years. The partnerships would help YouTube, which completed 10 years last week, secure higher quality advertising as it transitions from a repository of grainy home videos to a site with more polished content. YouTube has been trying to lure more premium video advertising to boost margins as overall prices for Google’s ads have been declining. The website, which attracts more than 1 billion unique visitors a month, far surpassing those of Netflix Inc and Amazon Inc, did not disclose how much it was investing or how the partnerships would be structured. Making films is not a trivial process; I think Google is going to discover how low returns can be when you just put something online. The move is no surprise, as viewers never warmed to 3D from their living rooms, despite a heavy push to make it the next big thing. On the flip side, on-demand television is booming according to Sky’s brand director Luke Bradley-Jones, which is why it has decided to shift its 3D content. “Since its launch in 2010, Sky 3D has led the industry, becoming the home of incredible 3D content – from Sir David Attenborough’s award-winning documentaries like Flying Monsters, to the biggest Hollywood blockbusters like Avatar,” he explained. Yeah, that would be “never”. 3D TV is dead; stick a fork in it. Google privately woke up to the fact that it needed to change the way it was operating in Europe last summer, according to Carlo D’Asaro Biondo, the French-Italian executive leading the group’s new charm offensive. “We realised in the last years we had a problem,” he says. In Mr D’Asaro Biondo’s analysis, Google should have offered a helping hand to all kinds of European industries as the digital world put increasing pressure on their business models. That did not happen. That neglect has exacted a high price. A series of running battles with the media and entertainment industries over copyright issues has expanded into wider competition complaints, resulting in this month’s action in Brussels. In case you wondered why Google would be lobbing €150m to various news organisations in Europe. …Health records are huge targets for fraudsters because they typically contain all of the information thieves would need to conduct mischief in the victim’s name — from fraudulently opening new lines of credit to filing phony tax refund requests with the Internal Revenue Service. Last year, a great many physicians in multiple states came forward to say they’d been apparently targeted by tax refund fraudsters, but could not figure out the source of the leaked data. Chances are, the scammers stole it from hacked medical providers like PST Services and others. More sterling work by Krebs. Tencent Holdings Ltd. released an operating system for smartphones and smartwatches Tuesday as it tries to win more of the 557 million Chinese accessing the Internet through mobile devices. The software, called TOS+, provides voice recognition and includes payment systems, Chief Operating Officer Mark Ren said during the Global Mobile Internet Conference in Beijing. Tencent follows domestic rival Alibaba Group Holding Ltd. in creating its own operating system for a country where more than nine out of 10 smartphones use Google Inc.’s Android. TOS+ seeks to tap Tencent’s stronghold in online gaming by including virtual reality and supporting play on televisions. Tencent owns WeChat and QQ – which together have more than a billion users. Are people going to replace their mobile phones for this? Are handset makers going to use it? Feels ambitious but hard to make work at the scale of mobile. Got anything you want to dump? “Goodwill” by Editor B on Flickr. 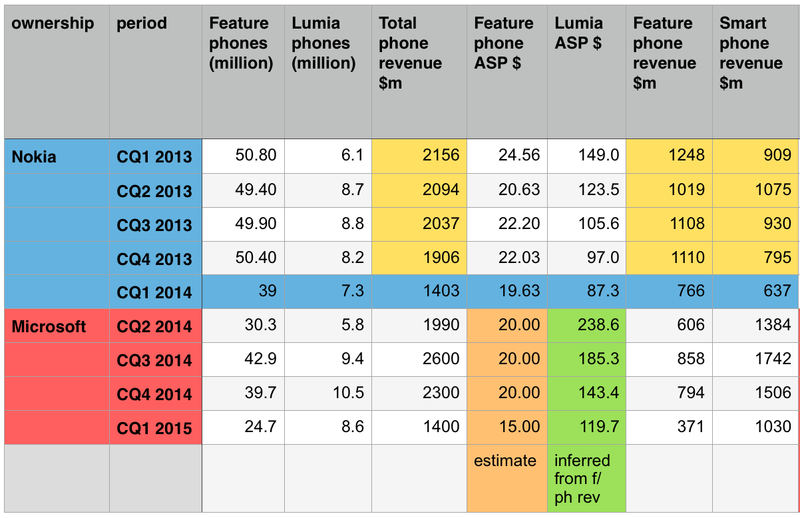 Did you read my piece about the negative per-handset margins of Microsoft’s Lumia phones? Oh, you should, it’s great. We determined that none of our reporting units were at risk of impairment as of our most recent annual goodwill impairment testing date. The valuation of acquired assets and liabilities, including goodwill, resulting from the acquisition of NDS, is reflective of the enterprise value based on the long-term financial forecast for the Phone Hardware business. In this highly competitive and volatile market, it is possible that we may not realize our forecast. Considering the magnitude of the goodwill and intangible assets in the Phone Hardware reporting unit (see Note 8 – Business Combinations of the Notes to Financial Statements), we closely monitor the performance of the business versus the long-term forecast to determine if any impairments exist in our Phone Hardware reporting unit. In the third quarter of fiscal year 2015, Phone Hardware did not meet its sales volume and revenue goals, and the mix of units sold had lower margins than planned. We are currently beginning our annual budgeting and planning process. We use the targets, resource allocations, and strategic decisions made in this process as the inputs for the associated cash flows and valuations in our annual impairment test. Given its recent performance, the Phone Hardware reporting unit is at an elevated risk of impairment. Declines in expected future cash flows, reduction in future unit volume growth rates, or an increase in the risk-adjusted discount rate used to estimate the fair value of the Phone Hardware reporting unit may result in a determination that an impairment adjustment is required, resulting in a potentially material charge to earnings. And how much goodwill is there? In Note 8, we find that there’s an allocation of $5,456m to “goodwill” for the acquisition of Nokia Devices and Services (NDS). Five and a half billion dollars of “no, honestly, it’s worth this much in the long term, just watch”. Now it seems those synergies maybe aren’t happening. Sony in September wrote down the expected value of its phone business by £1bn. And it has a mobile business that competes quite well at the high end. Microsoft’s writedown could be much, much bigger. Perhaps not as big as the $6.2bn writedown of aQuantive in 2012 (it wrote off the whole value of the acquisition), but potentially quite a lot. 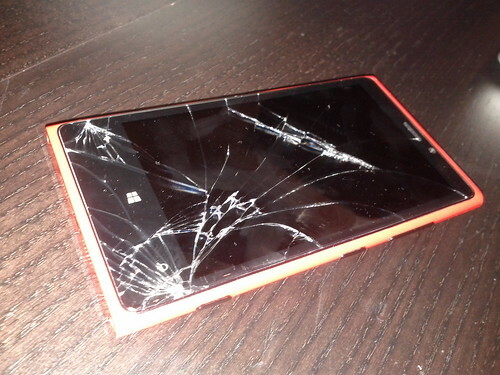 How much did this Lumia 920 cost to make? And will it have a successor? Photo by Whatleydude on Flickr. In case anyone was in any doubt, Microsoft’s results last week demonstrated once more what we’re coming to know about the mobile handset industry: it’s damned hard to make any money in it. When I published a fairly simple analysis of the state of the top-end Android handset market (with a comparator to Apple’s iPhone profits), people were apparently flabbergasted by how thin the per-handset operating margins were on these devices which sold for hundreds of dollars. See the original post for more detail and caveats. But Microsoft showed that it’s not even able to generate gross margin while selling millions of handsets. (Gross margin is the difference between how much it costs you to make the item – usually factory costs and distribution costs – and what you get for it. Gross margin normally excludes R&D and sales & marketing costs; to get the operating profit, you subtract those costs too, so operating profit is always less than gross margin.) 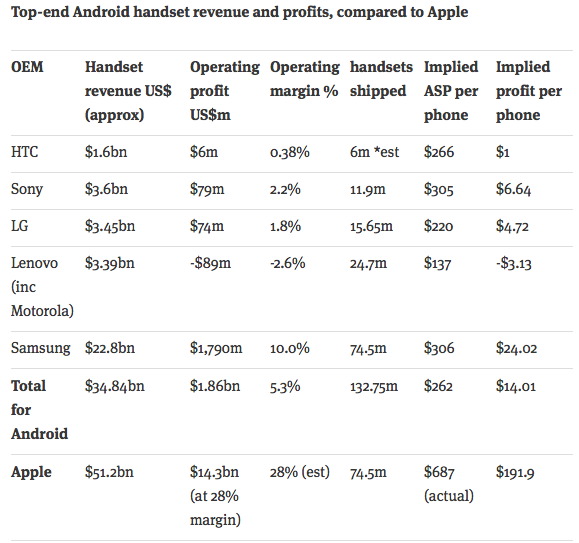 My analysis of Android handset makers looked at operating profit. Negative gross margin takes some doing; spending more making stuff than you take in for it is exceptionally bad business. But Microsoft Mobile did, officially: take a look at Microsoft’s 10Q for the calendar first quarter of 2015. Phone Hardware revenue was $1.4bn in the third quarter of fiscal year 2015, as we sold 8.6m Lumia phones and 24.7m non-Lumia phones. We acquired NDS in the fourth quarter of fiscal year 2014. Phone Hardware gross margin was $(4) million in the third quarter of fiscal year 2015. Phone Hardware cost of revenue, including $147m amortization of acquired intangible assets, was $1.4bn. For those unversed in accountancy notation, that “$(4) million” means “minus $4 million”. Accountants use brackets rather than a minus sign because it’s easy to overlook a minus sign and create a horrendous hash in your calculations. Phone Hardware revenue was $6.3bn in fiscal year 2015, as we sold 28.5m Lumia phones and 107.3m non-Lumia phones. Phone Hardware gross margin was $805m in fiscal year 2015. Phone Hardware cost of revenue, including $401m amortization of acquired intangible assets, was $5.5bn. This does take some untangling. In my analysis, I’m going to ignore the writeoffs (amortisation) of intangible assets – essentially, goodwill (“how much more we paid than the physical assets are worth”) being written down. This actually makes the gross margin look better – as in, in positive territory. That’s a start. Some brief history. When Nokia made phones, it used to provide wonderfully detailed results, in which it would tell you how many featurephones and smartphones it had sold, and at what average selling price (ASP). This made it easy to see how its business was going. It didn’t give you gross margins – only operating margin for the whole phone business. In general, though, we knew its featurephone business was profitable, and that once it moved to the Windows Phone Lumia range, the smartphone side lost a ton of money. Given the Lumia ASP and sales figures at Nokia, you could work out the ASP of featurephones, and their contribution to revenues. 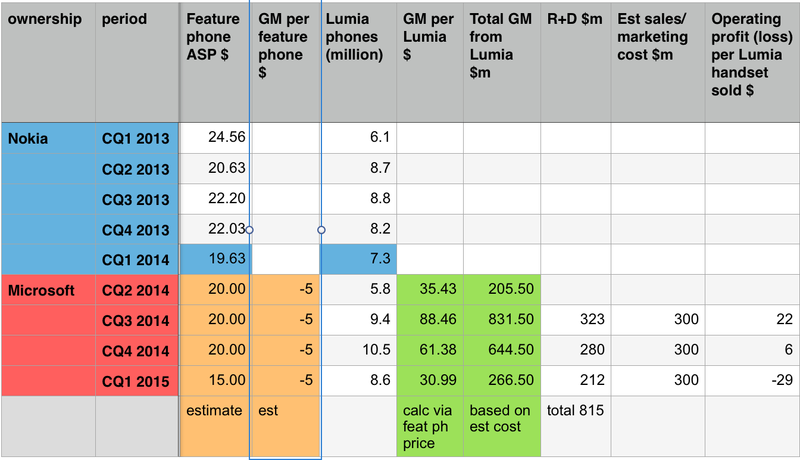 What I’ve done in the table below is use Nokia’s featurephone and Lumia ASP (converted from euros to dollars at the prevailing rate at the end of each quarter) and try to carry that forward to estimate the recent ASPs of Lumia handsets under Microsoft’s ownership, and their contribution to revenues. If you estimate the ASP for featurephones based on the Nokia numbers, you can figure out those for the Lumia phones at Microsoft. A few things to note: I’m assuming that featurephone ASPs are falling. Even with that, there’s a clear fall in the ASP of the Lumia phones – from (a really quite high) $238 in the second calendar quarter of 2014 to the present. There hasn’t been a flagship phone released in that time, so perhaps not surprising. Based on ASP assumptions, you can figure out how much revenue smartphones and featurephones generate. That’s not profit, though. Now we move on, to seek out gross margin. 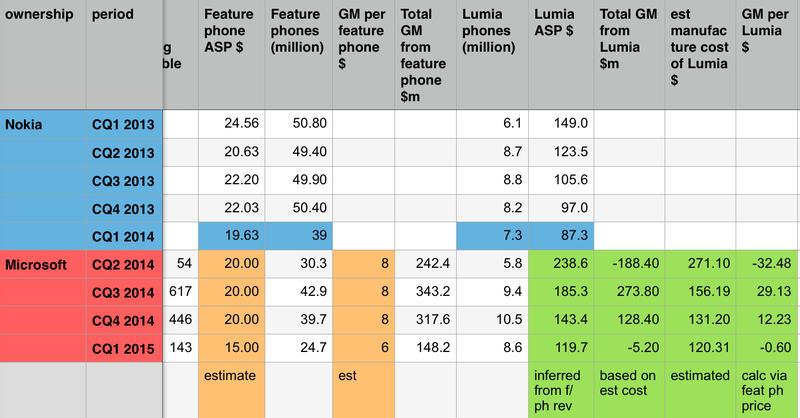 There’s no data from Microsoft about the separate gross margins of the featurephones or Lumias. We don’t know how much they cost to build, or which might be profitable. So we have to use estimates and what people tell us. Fortunately, we do have some indication of how profitable Nokia featurephones were. In an interview in April 2013, Nokia’s director of platform and content said that the profit margins on the $20 Nokia 105 were the same as those on the Lumia phones. How much might that be? Again, we don’t know, but it can’t be a lot. Putting it at $5 seems reasonable. 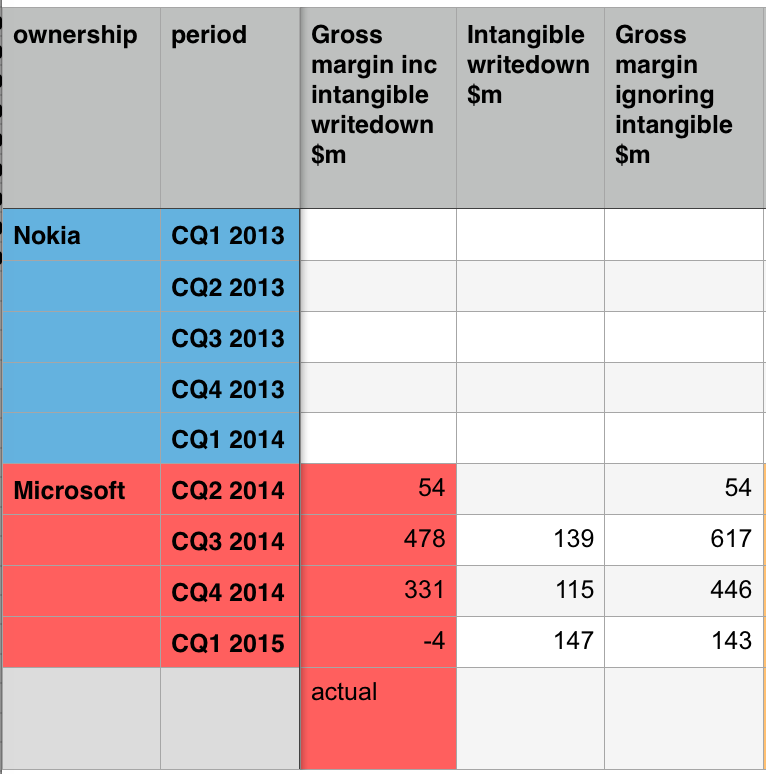 Microsoft gives quarterly figures for intangible writeoffs; subtracting that gives the hardware gross margin. 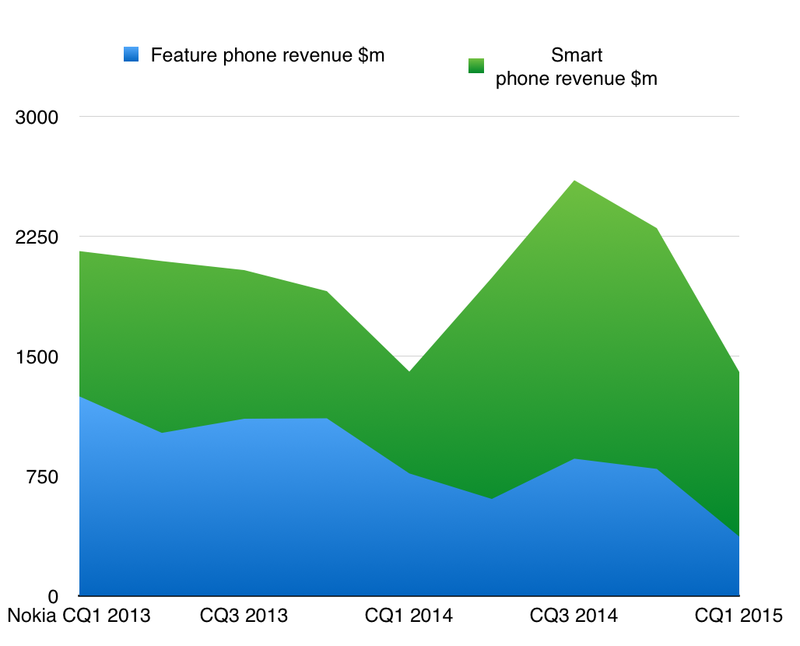 Now we make assumptions about featurephone gross margin. I’ve gone for $5, falling to $4 as the average price of the handset falls from $20 to $15. From this, and from the data we’ve got about total phone shipments, it’s quite simple to back-calculate to come out with figures for the total contribution to gross margin by featurephones and Lumias. 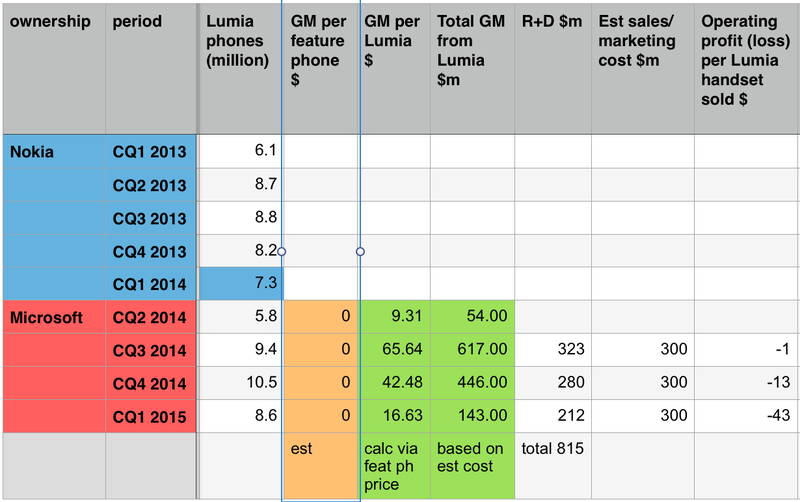 If we assume per-handset profit on featurephones, we can use that with the GM data to figure out how much Lumias cost to make. And we have the ASP.. Which tells us what? The CQ2 figure is anomalous – Microsoft mentions an intangibles writeoff in that period, but doesn’t specify how much (unlike other periods). It’s likely the total gross margin was larger if you ignore that, which would put the gross margin per Lumia into the black. Giving a per-handset profit of $8 for featurephones makes the Lumia business look much worse. It’s unlikely, though. 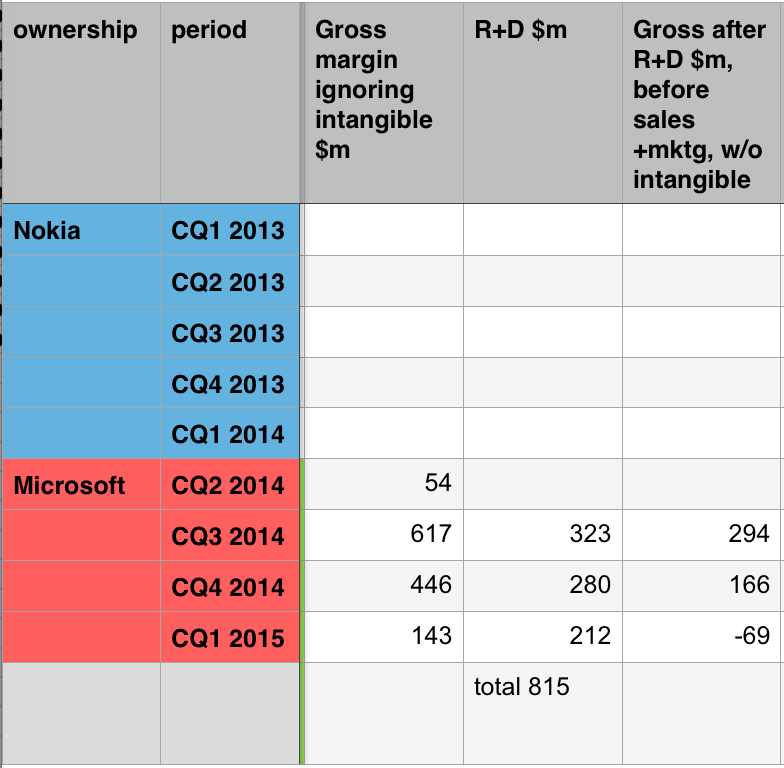 On this higher profit for featurephones, the Lumia gross margin goes into negative territory. You can argue that’s too high a margin for a featurephone. Doesn’t matter though – the direction of travel is clear: the Lumia barely washes its face. Three months ended March 31, 2015 compared with three months ended March 31, 2014: Research and development expenses increased $241 million or 9%, mainly due to increased investment in new products and services, including NDS expenses of $212 million. Research and development expenses increased $694 million or 8%, mainly due to increased investment in new products and services, including NDS expenses of $815 million. These increases were partially offset by a decline in research and development expenses in our Operating Systems engineering group, primarily driven by reduced headcount-related expenses. A little digging shows the R+D costs for the NDS (Nokia Devices and Services) segment by quarter. That gives us a sort of “halfway” operating profit once you deduct R+D, which shows that the division has moved into the red even before you consider sales and marketing costs. R+D numbers are mentioned in the quarterly 10Q. To get towards the operating profit (or loss), we need to subtract that. To figure out whether the handset division makes an operating profit we’d have to know the sales and marketing costs. It’s pretty improbable that those were anything less than $300m per quarter (that’s $10m per day, worldwide). Which means that Microsoft’s handset division has been loss-making since it took it over, despite those profitable featurephones, and ignoring the writedown of intangibles. On a per-handset basis, if you allow $300m per quarter for sales and marketing (into which we’ll also roll administration), then you get a clear picture: Lumia handsets don’t make an operating profit at all. Don’t forget, this relies on assumptions around featurephone profitability and price. 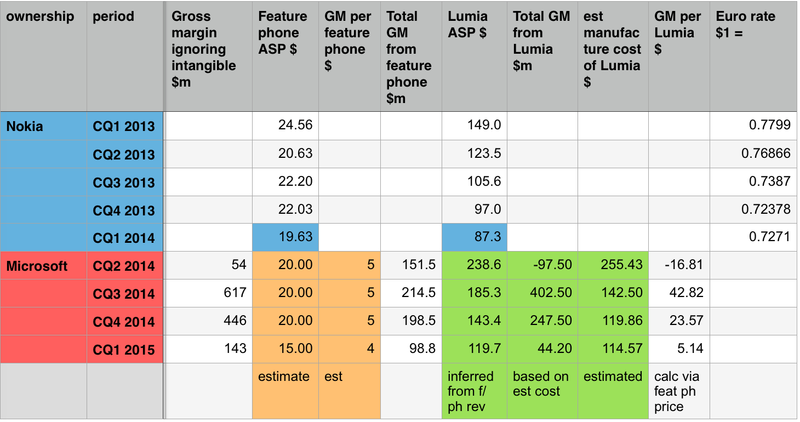 Even at a $5 loss per featurephone, Lumias aren’t moneymakers at the operating level (on my assumptions). You might have thought that Android handset makers had it tough, but at least – at the top end – they’re ekeing out something. We have made significant progress in reducing the operating expense base in the Phone business, moving from an annualized rate of $4.5bn at acquisition to a run rate under $2.5bn. Opex is R+D plus sales+marketing and things like general+administration; an annualised run rate of $2.5bn is $625m per quarter – which is slightly more than I was allowing there. That would make the Lumia margins worse. That said, the changing mix of our portfolio to the value segment and the significant negative headwind from FX [foreign exchange rates] will impact our ability to reach operational break even in FY16. Why, then, does Microsoft persist with Windows Phone? It can’t really think that it’s somehow going to come good and suddenly take off to challenge iOS and Android. The idea (which some outside Microsoft cling to) that the introduction of Windows 10, where apps can be written for both desktop and mobile, will suddenly lead to a huge uptake (by businesses?) is pie in the sky. Mobile and desktop have different design demands. Corporations with mobile needs haven’t been sitting on their hands for the past five years waiting for Windows Phone to reach a sort of maturity; they’ve been hiring people who can hook into their systems using iPhones and Android phones. Under Satya Nadella, Microsoft has recognised this, offering Office and other key software on rival platforms to capture (or retain) users and revenue. You can’t justify it on “they’ll make it back in profits on services”; the 80m or so Lumia owners around the world aren’t the high-end users, but low-end ones who are less likely to spend on apps, or pricey Microsoft products. So why? Two clear reasons. First, it’s important to keep playing in this space; Microsoft needs to have a mobile offering because it’s impossible to say where in the future a mobile-focussed offering might be key. Secondly, though, is that more simple one: pride. Couple that with the inertia of a big organisation, and the fact that in the scheme of Microsoft’s profits the losses from the mobile division (about $500m, ignoring intangibles, over the past three quarters) are piffling, and there’s no reason to stop. However, things could change. I’ve argued previously that Nadella should just give up on Windows Phone, and move to an Android fork. Not long after I argued that, Nokia (then still Finnish-owned) introduced the Nokia X, using Microsoft services and AOSP (Android without Google services on top). Microsoft rapidly killed it. But now Microsoft is preinstalling its apps on the Samsung Galaxy S6 – and more importantly, has a “strategic partnership” with Cyanogen. The latter is a huge, and smart, move: it seems to me the easiest way for Microsoft to make a real impact on mobile. If the Cyanogen move takes off, though, I could see Windows Phone withering. Why bother with loss-making hardware when you can piggyback on the world’s most successful mobile OS (that’s Android/AOSP) for the pure gravy of services profit? I wouldn’t. Marissa Mayer, CEO of Yahoo. You OK hun? Photo by jdlasica on Flickr. A selection of 8 links for you. Count them, I dare you. I’m charlesarthur on Twitter. Observations and links welcome. You’re stuck at an office all day, deleting all-staff emails and futzing with the office printer. But imagine if you were also part of an online group, pretending that you were in an office all day. That’s what’s happening at one of the latest cult Facebook Groups, Generic Office Roleplay. Over 2,500 members from around the world fill its virtual pages with posts that mimic office-wide emails. There are passive aggressive notes about food stolen out of the fridge, mandates about office dress and office supplies, and tips for improving synergy. Think TV’s The Office meets David Rees’s clip Art cartoons, My New Filing Technique is Unstoppable meets live action role play (LARP), all happening on Facebook. Adi Sharabani and Yair Amit have revealed a zero-day vulnerability in iOS 8 that, when exploited by a malicious wireless hotspot, will repeatedly crash nearby Apple iPhones, iPads and iPods. The Skycure bods say the attack, dubbed “No iOS Zone”, will render vulnerable iOS things within range unstable – or even entirely unusable by triggering constant reboots. “Anyone can take any router and create a Wi-Fi hotspot that forces you to connect to their network, and then manipulate the traffic to cause apps and the operating system to crash,” Sharabani told the RSA security conference in San Francisco today. The denial-of-service is triggered by manipulating SSL certificates sent to the iOS devices over Wi-Fi; specially crafted data will cause apps or possibly the operating system to crash. Fix in the works. Somewhere. Samsung Electronics Co.’s newest high-end smartphones – the Galaxy S6 and the Galaxy S6 Edge – are seen drawing less than expected attention from consumers, industry data showed Wednesday, casting clouds over the market’s upbeat sales estimate of over 50m units for 2015. …industry watchers have been painting rosy pictures of the gadgets, with Hong Kong-based industry tracker Counterpoint suggesting the two will sell more than 50m units this year, while some researchers even gave a 70m-unit forecast. But some industry watchers say the 10-day sales figure is not alarming, given that South Korea’s already saturated smartphone market is currently dented by the country’s regulations on subsidies. Korea may be a special case (and the story says carriers are pushing harder on subsidies). But I think Samsung might find the top end saturated. This is going to be fascinating to watch play out. The U.S. has the highest average revenue per subscriber (ARPU) of the 29 countries sampled in the analysis at about $59. Yet as far as network speed goes, the U.S. ranks 26th out of 29, supplying an average connection of 7 Mbps. Meanwhile the lowest ARPU in the sample, $3, belongs to the Philippines, yet its two LTE operators deliver average speeds of 8 Mbps, ranking the country above the U.S. The fastest LTE performance can now be found in Northern Europe, Spain, France, Hungary and South Korea, where speeds between 16 and 18 Mbps are the norm. But the differences in ARPU between them are huge. In Denmark, ARPU is around $19 a month. In Norway that number is $34, which is more in line with South Korea’s ARPU of $33 than it is with Norway’s neighbor just over the North Sea. 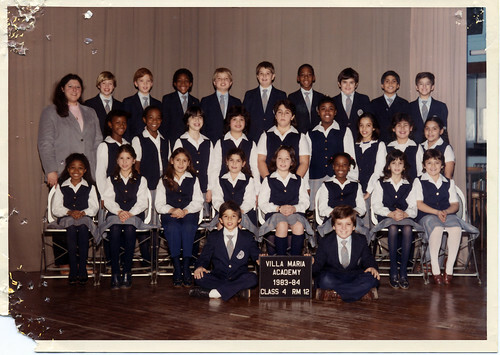 Within countries, the pattern – or lack thereof – was the same. In the U.K., EE has the distinction of having the fastest speeds (17.8 Mbps), seemingly justifying the $2 to $6 more it collects in ARPU over its competitors Vodafone and O2. But in the U.S. the opposite is true. T-Mobile has by far the fastest speeds (10 Mbps) compared to Verizon, AT&T and Sprint, but its ARPU is $49, undercutting its next cheapest competitor by $8 a month. Shares of Tesla rose nearly 5%. A close around those levels would be Tesla’s highest in two weeks. Tesla shares have gained 9% in the past three months, but lost 1.4% in the last 12 months. That compares with gains of 2% for the S&P 500 index SPX, +0.27% in the past 12 months. Tesla Chief Executive Elon Musk said Tesla was working on a battery for homes and business back in February, when the company announced fourth-quarter results. Last month, Musk tweeted about a new “major product line” to be unveiled on April 30, saying only it was not a car. Regular readers have known this since 3 April. When Jonathan Wegener and Benny Wong started Timehop in 2011, they were working on a completely different project: a Craigslist replacement. Wong and Wegener — self-proclaimed “Foursquare fanboys” — participated in Foursquare’s first-ever hackathon, and they ended up building out a product on top of Foursquare’s API that showed users where they checked in on Foursquare a year ago. They appropriately called the product, which they built in eight hours, 4SquareAnd7YearsAgo. First time that a useful idea has taken inspiration from a game concept? I will take the question on the Safari deal. The Safari platform is basically one of the premiere search engine in the world, if not the premiere search engine in the world. 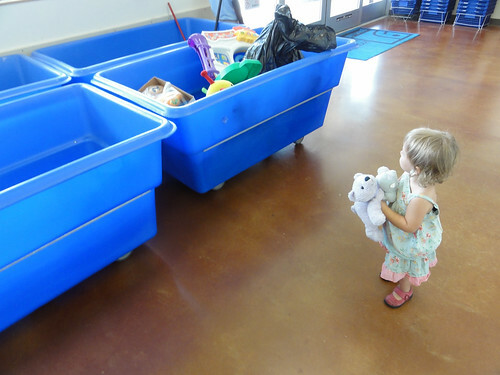 We are definitely in the search distribution business. I think we stated that really clearly in the past and I think with Mozilla and also in addition we brought Amazon and eBay onboard with smaller distribution partnerships in Q4, we are in search distribution business and anyone who is in that business needs to be interested in the Safari deal. The Safari users are among the most engaged and lucrative users in the world and it’s something that we would really like to be able to provide. We work really closely with Mozilla to ultimately bring to their users an experience that they designed and that they feel really suit those users and we welcome the opportunity with any other partner to do the same, particularly one with Apple’s volume and end user base. So hated is AdBlock Plus, in fact, that a case was brought against the tool to try to prove that it is illegal. Now a court in Hamburg has come to a decision, and ruled that AdBlock Plus – in case there was ever any doubt – is entirely legal. The plaintiffs in the case alleged that AdBlock Plus should not be permitted to block ads on the websites it owns. The judge presiding over the case disagreed. ABP’s Ben Williams enjoys his Nelson Muntz moment on the company blog. You could watch this instead of YouTube on your old Apple TV or smart TV. 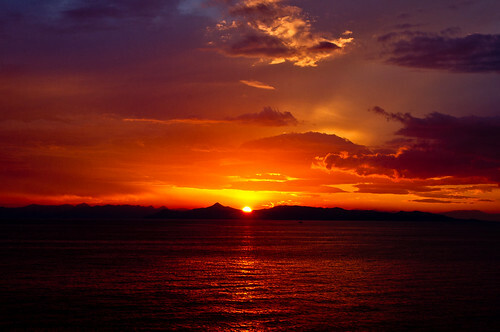 Photo by ~Prescott on Flickr. 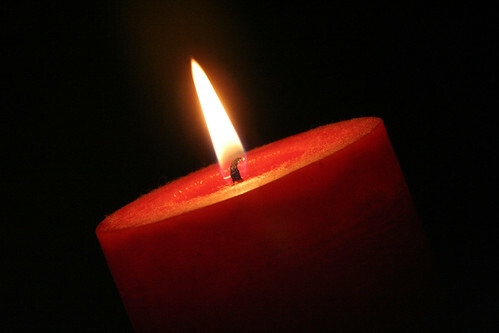 A selection of 7 links for you. Al dente. I’m charlesarthur on Twitter. Observations and links welcome. 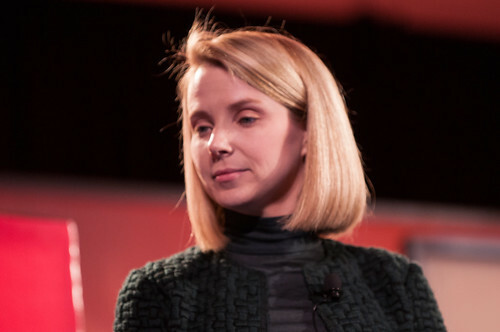 Marissa Mayer must have described Yahoo as a mobile-first business a dozen times or so on the earnings call this afternoon. However, as Yahoo has also been quantifying its mobile business lately, we have some hard numbers to evaluate this claim by, and they’re not all that good at backing up her repeated claim. Graphs don’t lie. Get left behind monetising mobile, and you’re left behind. The other lesson that Google has clearly learned from Microsoft’s failures [to forestall antitrust action in the US and Europe] is that this is as much a PR battle as a legal one. Microsoft, wherever it went, was the nasty, unstoppable and lethal Goliath, gaining no sympathy in any quarter. 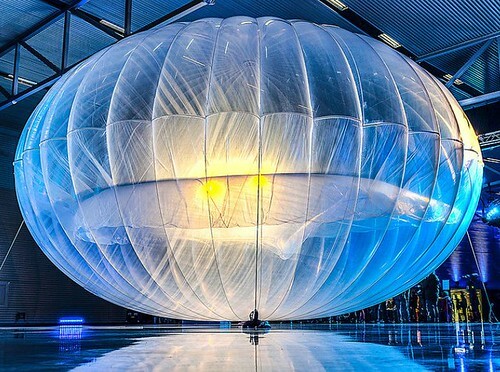 Google, as nasty, unstoppable and lethal as Microsoft, understands the vast benefits of being, if only through the looking glass, the highest example of innovation and forward-thinking. Europe, and anyone who would get in its way, is the past, and Google — and you don’t want to miss this train — the obvious future. Much of the world, including the world’s media, once happily aligned against evil-empire Microsoft. Google’s bet now is that the world is a different place: the bias is actually for hegemonic tech companies instead of against them. Google is likely more dominant than Microsoft, both in the market and in the lives of its users, but that may well be to its benefit. YouTube apps on older Apple TVs, smart televisions and iPhones may no longer work today after Google switched off an API that served many of these older devices. Products sold as recently as three years ago may no longer be able to stream from the world’s biggest video service. The retirement of Google’s Data API v2 will leave some YouTube apps unable to show anything more than a warning message. Second-generation Apple TVs, iPhones and iPads running on iOS 6 or earlier, and many smart televisions, set-top boxes and Blu-ray players sold before 2013 will all be affected by the switch off. Google has published a support page showing how different devices will be affected. Second-generation Apple TV owners are warned that “unfortunately, there’s no current way to watch YouTube on these devices”. Those still running iOS devices on iOS 6 or earlier are told they will either have to upgrade their OS (if possible) or watch YouTube video by going to the YouTube mobile site in the Safari browser. Older smart TV or games console owners are advised that they too may be able to continue viewing YouTube through the device’s web browser, but only if that browser supports flash and/or HTML5. Depending when you reckon smart TVs came along, this could hit between a third and half of those in place; TV sets get replaced about once every ten years. Having a YouTube app on a screen that doesn’t function to show you YouTube seems like a bit of a hassle. So true. Comments nail it too. The Gear Fit has a few downloadable extensions, based on a SDK also released a year ago. The fact extra apps can be created and maintained is a very important indicator of not only the market success of a given device, but also of the obsolescence of the device. That SDK is not available any more from http://developer.samsung.com, as it is confirmed here. And it’s not a very recent change. Samsung then turned obsolete – because of software – a hardware they released less than a year ago. From a customer’s perspective (again, I bought that device), that’s pretty shocking. The Samsung Gear Fit is still available everywhere here in France, from Orange stores to supermarkets. But it’s a dead duck without a SDK. Don’t buy it. Apple Watch doesn’t have GPS, so you have to carry your iPhone with you if you want to track your run with GPS. Even if you do run with your iPhone, neither the Workout app nor the Activity app show you maps of courses you have run. Also, the Workout app doesn’t show runners things like splits or cadence, although it’s possible that a third-party app could utilize the watch’s sensors and display this. And the Workout app doesn’t give audio alerts at key points throughout your run, which many running apps do. That said, the Apple Watch automatically calibrates to your stride during your first few runs, so that even if you later run without your iPhone, you’ll get a close-to-accurate reading on distance. I found this to be true when I ran a couple of my regular neighborhood routes, and when I ran a 5K road race on an unfamiliar route, without my iPhone. Apple Watch recorded my 5K race as 3.05 miles, just .05 shy of the actual distance. HTC is reportedly stepping into the IoV (Internet of Vehicles) market and has one of its in-car wireless devices, the Think+ Touch OBU 2015, certified by Taiwan’s National Communications Commission (NCC), according to industry sources. The Think+ Touch OBU 2015 features Bluetooth, GPS navigation, a lane departure warning system, tyre pressure monitoring system and sonar-based collision avoidance system, while supporting Android 4.4 KitKat platform, the sources noted. Interesting move by HTC, though wonder how much retrofitting this would take (tyre pressure monitoring?). Also, please let “Internet of Vehicles” not be a thing.